The Getting To Know series features interviews with makers, artists, designers and small business owners at all different stages of their careers. I’m always interested in how other adventurers in the world of creative entrepreneurship run their businesses, get inspired and how they got started in the first place. Hi Krista! To start with, I’d love to know a little bit about you and your business. I’m a Vancouverite who had to travel and live around the world to realize how much I loved my hometown. I learned to knit while on a university exchange in small town New Zealand: a country with more sheep than people. RainCityKnits was born out of a love of bright colours – an antidote to the the endless grey season here on the West Coast. We strive to offer high-quality products that are ethically created, without compromising on aesthetic. Prior to launching RainCityKnits, I worked internationally on issues of sustainability and social justice. My passion and commitment to these issues guide my business practices. What’s the story behind the name RainCityKnits? Those of us who live in the Pacific Northwest are very familiar with rain. Vancouver is often referred to by locals as the Rain City. I wanted the brand to reflect the location from where RainCityKnits comes. Rain also evokes a desire to snuggle up in warm woolens so the name just fit. If I could go back and change things, I’d probably re-think the word “Knits” and go with “Dye Studio”. How did you get into dyeing yarn? Truthfully, I couldn’t find the colours that I wanted on the quality of yarn bases that I like to knit. My experience has been that bright yarn colours are often seen as childish. A function of this attitude is that the truly bright colours are often limited to acrylic or other “economical” yarns. I tried dyeing some bright colours on a lark one day and here I am. Do you prefer dyeing or knitting? I don’t really think I have a preference. They are different activities, performed in different contexts. Dyeing is more “organic” than knitting, in that you can experiment more while having successful results. Knitting is more regimented and repetitive. They appeal to different aspects of my personality. What have you been knitting with your yarns lately? I’m currently working on a sweater coat by a Norwegian knitwear designer in our Steel Grey Worsted. I’m a huge fan of Nordic designs. I love the tendency toward “strong shapes” that are modern, simple and unfussy. I just finished a pair of socks that use our Graffiti yarn and Hot Pink accents by Vancouver-based designer Holli Yeoh. How would you describe your relationship with colour? Do you have a favourite? I’m a huge fan of bright colours. I’m particularly interested in neons at the moment. I love seeing a super bright colour like Electric Coral paired in a sweater with a neutral like a cream-colour. Lucky me, neons are super popular at the moment, which is great. I’ll still love neon after the trends move on too. Where do you find inspiration for your brand? I take a lot of my inspiration from the street fashion I saw during my time living in London, UK. I admired the boldness of the younger Brits who aren’t afraid to mix colours and patterns together and thought “Why can’t this be the case with knitting too?”. I like the idea of taking something traditional like knitting and pushing toward a more modern aesthetic. RainCityKnits seeks to use ethically sourced fibre. Could you tell us a little bit about that and why it’s important to you? When RainCityKnits started out, I sourced all my Merino Wool from a Uruguayan mill. The employees there were organized as a Worker’s Collective – a popular way of structuring a labour force to ensure fair rate of pay. As the business has evolved, I’ve expanded my range of fibre to represent customer requests from a variety of suppliers. I work closely with yarn distributors to understand the supply chain involved in the cultivation of the fibre I use, favouring Fairtrade and Organic yarn bases where possible. I am hoping to work with a local farm to source fibre closer to home in 2015. The best selling item at the moment is our Graffiti and Highlighter Yellow colourways. I think the craziness of these colours makes for fun knits and something a little bit different than what you might find elsewhere. Personally, my favourite yarn colourway is Electric Coral. There’s something about this colour that just makes me so happy. I actively have to talk myself out of knitting everything from this colourway, with moderate success…. One of the neat things about running RainCityKnits is that no two days are the same. There’s constantly a shifting list of priorities and tasks. That said, I’ve developed a bit of a structure to help me be as efficient as I can be. Mornings are spent taking care of admin stuff – responding to emails, invoices etc. The boring stuff to many makers, although I do enjoy getting things organized. Lunch is spent at the dog park with my 2.5 year old Labrador Retriever, Pamela. Working in the neighbourhood means that I’m able to spend a lot of time with my dog. We have a group of “dog friends” over there who we meet at noon every day. This midday checkpoint actually helps keep me accountable timewise, which is perfect since I am easily distracted. After lunch, I’ll head over to my studio to get the dyeing process started. I’m very lucky and the studio is located a short walk from our home in Railtown. The studio itself is part of an artist-run centre which offers 22 studios for rent at a really reasonable rate. This has allowed me to expand RainCityKnits. I dye to order. To keep things organized, I work with a dye rotation schedule of about 14 days, which means I dye one colour once per fortnight. For example, I dye all my Hot Pink colours together on Day 1 and then my Vermillion (Red) colours on Day 2 etc. This leads to a slightly longer turnaround time for customer orders, however it means that I’m able to minimize wastage of water / dye and also to keep my wholesale customers happy too. Throughout the day, I make a point to look at my social media – especially Instagram. This also helps to keep me feeling connected to the world outside! I love seeing what customers are doing with our yarn! There’s so much that I love about running my own business. I think the best part of running RainCityKnits is that I have complete freedom to take the business in any direction that I choose. It turns out that I have a strong point of view about colour and I have found a way to share my viewpoint. I actually never considered myself to be artistic before I started RainCityKnits. Running my own business has allowed me to develop a creative part of myself that I haven’t given much credit to before. That part is pretty awesome. I also really love the flexibility that running my own business provides me in terms of scheduling. I know this is one of the parts that appeals to many self-employed folks. That’s not to say that the hours aren’t long – they are! – but I am able to choose when I work. The hardest part of running my business is flying solo a lot of the time. At first, working alone from home was a novelty. I’m quite a social person though and at this point, the novelty has worn off a bit. Loneliness is super common with self-employed folks, and emphasizes the importance in ensuring one has interaction with people outside of work through social activities, community involvement etc. Pamela the Lab and I have just signed up to be volunteer visitors at an Adult Day Centre, which we’re both excited about! Do you do many craft fairs? I do 3-4 fibre related shows per year. In the beginning, I did do a few non-fibre specific shows and through that process, found out who my demographic really is: knitters, crocheters, so essentially fibre people. The shows I attend – including the Knitter’s Frolic in Toronto – are full of enthusiastic customers. I really love meeting customers face to face and sharing in their excitement. Working alone in the studio, it can be easy to forget about the big picture. When I go to a show, I’m reminded just how awesome fibre people are. The days may be long, but it’s totally worthwhile. What do you do to get inspired when you’re feeling drained? If I’m feeling drained, I’ll usually take a walk around the neighbourhood into adjacent Gastown and check out what people are wearing. I find that process really reinforces my overall vision by reminding me of what I love! We are a very urban brand so it makes sense to take inspiration from the heart of the city. I also find that shifting gears away from work really helps me too. Meeting up with friends, doing something fun and non-work related and usually silly helps a lot. When I do return to work, I’m more inspired. If you could spend a day with any maker/artist, who would that be and why? This is the toughest question yet! There’s such an insane amount of artistic talent out there. In terms of my own industry, I really admire Stephen West for his creative knit designs. He is someone who pushes the envelope in terms of re-imagining what knitwear can be and he’s gained a huge following from a diverse range of knitters too. I love seeing older folks knitting and wearing his designs. He proves that everyone can appreciate edgier styles. I’ve just discovered visual artist Alison Shields who works out of the same artist centre as I do. She uses very simple tools – tracing paper and pencils – to create these layered drawings that are different than anything I’ve seen before. Her pencil drawings hint at natural landscapes without being too overt. I’d love to watch her creative process. What is one thing you wish you had known when you launched your business? When I started, I had no idea that my little hobby would grow into a business. As a result, I didn’t have a bookkeeping system in place. When tax season rolled around, I had nearly a year’s worth of accounting to catch up on. My advice, boring though it may be, is to get some basic bookkeeping system set up. There are lots of online systems that can help – I personally love StitchLabs, which is geared toward crafters. Also, if you plan to sell online through a platform like Etsy, be sure to do your research on your tax obligations to customers in the regions to which you sell. Again, not the most exciting way part of running a business but super important. You don’t want a nasty surprise at the end of the tax year when you find out that you should have collected tax from customers! Treat yourself to some RainCityKnits goodness. What did you learn from getting to know Krista and RainCityKnits? Share with us in the comments! This holiday season, we’ve asked some of our favourite creatives, bloggers, makers and OMHG members to join us in rounding up great gift ideas. For our final week, instead of gifts to buy, we’re rounding up lovely things to make during the holidays. This adorable printable garland and gift tag set from Evie Barrow is the sweetest thing, download + print + cut your way to a creative Christmas! Wrap up your small packages with these free printable wrapping paper designs from Shauna Lynn Panczyszyn (also be sure to check out her 12 Patterns of Christmas project)! Paper snowflakes are always a fun holiday tradition! Free printable templates can be found here. 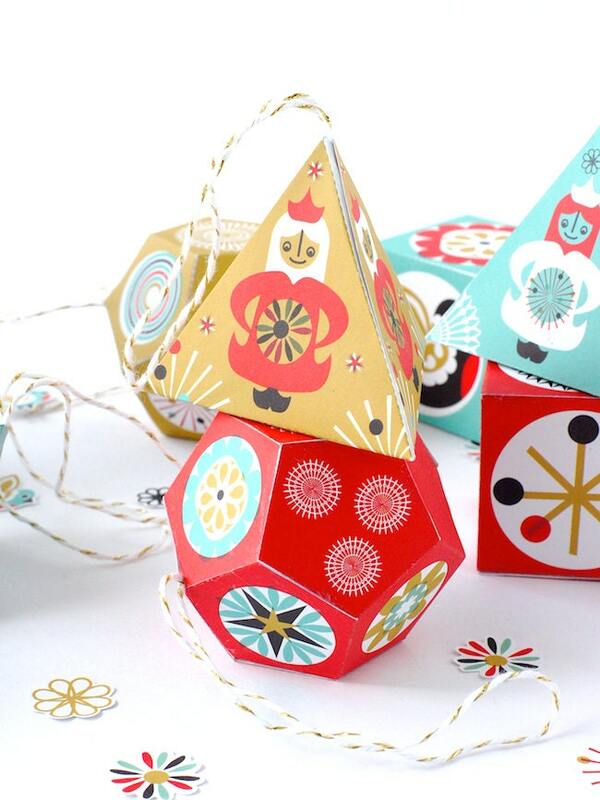 Print, cut and fold these adorable Scandinavian-inspired paper ornaments from Sam Osborne. The talented folks of the Happy Happy Art Collective have been sharing a free printable every day of December, go visit them to find this sticker set from Denise Holmes and a whole pile more! There’s still (a little) time to whip up new Christmas stockings. Here’s a lovely project from our archives. 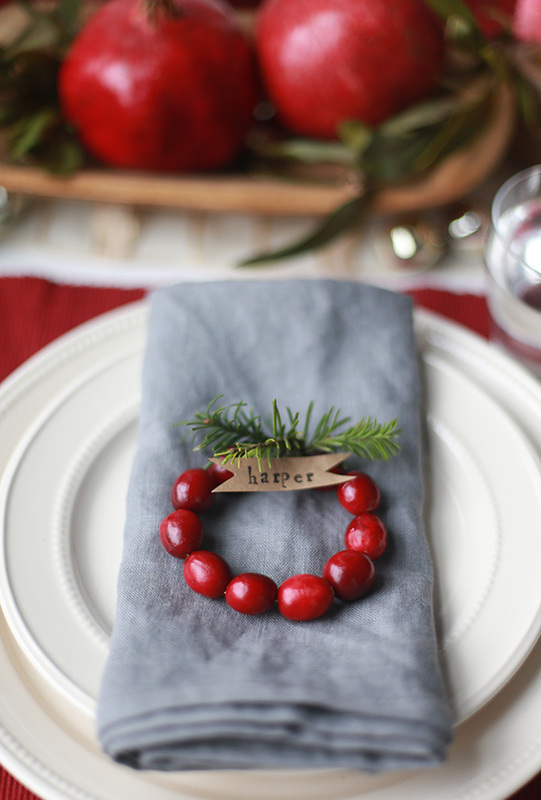 Add a special touch to your holiday table with these Mini Cranberry Wreaths from Say Yes. Follow Oh My! Handmade ‘s board Merry Makers on Pinterest. How will you be celebrating the holidays this year? Handmade details and a big turkey dinner? Or perhaps kicking back with some take out and good friends? We’d love to hear all about it in the comments!